(April 17, 2005) The Fireflies are avid cyclists out to make a difference in the environmental scene. They hold the annual Tour of the Fireflies, a critical mass ride deep into the bowels of Metro Manila's busiest arteries. Now, on its 7th year, it's a 50 km. 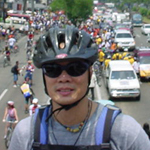 route with the theme, "Maki-BIKE Ka - sa ikauunlad ng bayan, bisikleta and kailangan". I wasn't paying attention to the details. I thought it was a few laps around the Elliptical Circle. I didn't even bother bringing my hydrapak or wear bike shorts...WRONG! Before I knew it, we were deep into the inner streets of the city riding side-by-side with cars and buses. I was impressed by the level of organization. They had ample Marshals who stopped traffic in order for the mass to ride through. Surprisingly, the local police within their respective municipalities were also there to keep the flow running smoothly. There was an ambulance nearby and there was also a 'casualty truck' giving lifts to riders who can't make it anymore. Riders were also very helpful in extending assistance to those experiencing mechanical issues. There were convoy cars and vans providing life-giving water along the way. Some veteran riders say this is the biggest turnout ever. I don't have the number but when I was at the tail end of the peloton along España, I could see an ocean of heads all the way to the Welcome Rotunda. Some came in costumes - fairies, scarecrows, indigenous tribe folks, etc. One of my disenchantments is what I perceive as an indifference of the general public to the quality of the air they breath. When I travel, I take delight in exploring a new place on foot. Here, I can't do it. It's bad enough that it's hot and humid, but if you aggravate that with black emissions from motor vehicles, finishing a block is plenty. A casual talk with a radiologist reveals that respiratory ailments are on an uptrend. There are emission laws in place but I hear that a P700 bribe takes care of that. What else is new? When I clean my room which fronts the busy Xavierville Avenue, I don't get dust from the shelves. I get soot. No kidding. With the Firefly Brigade, I'm glad someone is taking notice, and more importantly, being pro-active in making a difference. Apparently, given the turnout, there is a swelling tide of riders who feel the imperative to clean air. I hope the movement builds momentum. (22 Apr 2005) You're the lonerider pala. tj, here.. turo-turo, akyat-akyat participant.. nice post about last sunday's tour of the fireflies...mag-marshal ka na next year.. anyway, when are you guys going back to montalban? thanks. (20 Apr 2005) Hi, Lone Rider. Thank you for joining the Tour this year and featuring it on your website. You'll be interested to know that we estimate the number of Tour participants last Sunday to total 4,000. We hope you'll join the critical mass rides on May 20, June 17, July 22, and August 19, which are all Fridays. These rides will culminate in the World Car-Free Ride on Sept. 23, also a Friday. Please email blinking_fireflies@yahoo.com for more details. (19 Apr 2005) kudos to the marshals, i heard similar praises from other riders too, to think the marshals were so few compared to the thousands who rode. uhm, i remember this lone rider, he asked to take a picture of "the fairy" at the balintawak stop. kaya po ganyan ang expression ko sa picture, i kept telling him, "di po ako fairy! firefly po ako!"